Too many teachers never get a chance to experience first hand the effect that they have on the world. 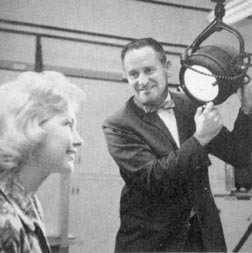 H. Warren King, photography instructor, has mentored over 16,000 students during the last 50 years. Many of Warren's students have gone on to be professional photographers. Many have gone into other professions. But all of Warren's alumni have at least one thing in common. They cite Warren as one of the most influential teachers in their lives. Warren doesn't just teach photography. He teaches his students a new way to see. Tribute to Warren King. As a result, hundreds of alumni from Warren's high school and adult school classes from the years 1950 to 2000 converged in Los Angeles on March 31, 2001 to attend a Tribute Dinner celebrating the accomplishments of a great teacher, and a great friend. All proceeds from the event were donated to the Warren King Foundation Scholarship Fund, creating an endowment in Mr. King's name which will provide college scholarships to deserving high school photography students. Alumni attended from 36 states, Europe, and Japan, from as far back as Warren's first class at Poly High in Los Angeles to pay homage to this very special man. To allow everyone to participate at some level, we have formed the Warren King Alumni Association. and we invite all of Warren's alumni and friends (including you!) to join for free. Warren was presented with a book containing a lifetime class roster of all his students, their contact information, and messages. When you join the Association, your name will be added to Warren's book, and you will be in the loop for information about future activities. So please take a moment to complete the short registration form now. We have been overwhelmed by messages from alumni who have expressed their admiration, respect, and appreciation for Warren King, and have described the effect that Warren has had on their lives. You will find their comments in the Guest Book on this site, and you are invited to add your own message for Warren. While you are here, you can check out Warren's History, and don't miss the chance to find yourself in one of the Photo Club Pictures, a complete set from 1955-1987. Please click on the link below to register and send Warren your contact information. I would like to support Warren's Scholarship Fund.